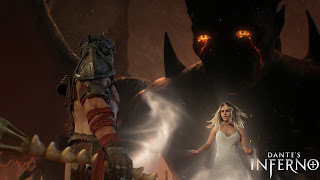 I'd like to begin my review of Visceral Game's Dante's Inferno first addressing the one complaint that seething fanboys seem to have with the game; the fact that it follows a path set by Sony's God of War series. It follows that path, an epic action/hack-n-slash/platformer, without question, akin to how 2009's Shadow Complex slapped a fresh coat of paint on 1997's Castlevania: Symphony of the Night (which, was created as almost a direct copy of 1994's Super Metroid). Castlevania SOTN is still lauded by gamers as being one of the best 2D games available, especially in the highly 3D world of the first PlayStation. Shadow Complex, was one of the top selling XBLA titles from last summer that publicly spoke of it's Metroid/Castlevania influence. I didn't get the same vibe from the above games, as I do today with the Inferno/GOW showdown. Perhaps it's due to GOW having its third-installment due out to gamers next month, I am not sure. All of this being said, I've decided to review Dante's based on it's own merits, presentation, source material and overall enjoyment (how I believe any game, book, movie should be reviewed). In that regard, you're in for a fairly exciting ride, scooped directly from a 14th-century poem about Dante's journey through the 9 circles of Hell. In reality, not exactly the source material you'd expect for a video game, but it translates well. 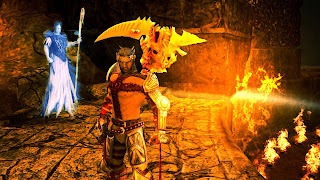 Those that compare the single level in God of War wherein Kratos is fighting back from Hell, to the fully-realized 9 circles of Hell, well there just is no comparison. Dante will travel through Limbo, Lust, Gluttony, Greed, Anger, Heresy, Violence, Fraud and Treachery; all equally fascinating, and scary places to explore in hopes of freeing his love Beatrice from the clutches of Lucifer. Too bad you can't truly explore the circles, as the game is as linear as an equation. That's not to say it's bad, in fact, the execution here by Visceral Games is really good, presentation and graphics are excellent, the controls are solid and very responsive, and gameplay is what you'd expect from the genre, (there's not much newly formed ground here). As you play, you'll collect souls, to level up your Holy or Unholy powers. (Tip: Focus on one or the other, so you gain access to some of the higher skills in either tree). You'll also collect Relics, that once equipped, offer advantages in gameplay, that have up to three levels of increases; using these in different scenarios will prove useful. Combine plenty of action, with some platforming and puzzle-elements, and you have yourself a rousing game. Most will finish in under 10 hours, though the end hints at sequel or DLC, we're not sure anything's been announced yet. Beating the game enables a "new game" option available which unlocks more difficulties if you're feeling up for it. 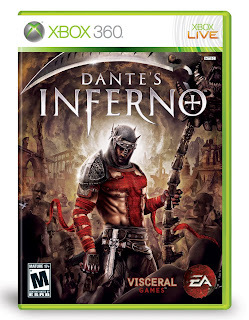 Dante's Inferno is available now for Xbox 360 and PlayStation 3 . Also, if you want to explore more, Dante's Inferno: An Animated Epic is also available on BluRay and DVD , as well as various copies of the source material.